Tucked peacefully within the forests of southeast Alaska, on the western shore of American's longest fjord--the Lynn Canal, Haines is surrounded by scenic majesty and abundance of wildlife. The beautiful Chilkat Valley draws thousands of visitors who come to enjoy the year-round opportunities for outdoor recreation and wildlife viewing. This small community is often called "Alaska's Best Kept Secret". Haines lies on the shores of the Lynn Canal on the Chilkat Peninsula between the Chilkoot and Chilkat Rivers and is bordered by the spectacular Chilkat Mountain Range on the west and the Coast Range on the east. The historic routes to the Klondike gold fields - the Chilkat, Chilkoot and White Pass - are to the north of the community. The area encompasses 13.5 square miles of land and 8.0 square miles of water and is home to approximately 2,500. Haines is 85 air miles northwest of Alaska's capital city of Juneau and about 600 air miles southeast of Anchorage and Fairbanks. It is connected by road to the interior of Alaska and the continental United States by the Alaska Canada (Alcan) Highway. The Population of Alaskans 65 years and older is expected to rise 5 to 6% annually from 2008 to 2020. Haines has the highest growth rate of seniors per capita in the state. Prior to Haines Assisted Living's October 2009 opening, those in need of care in Haines had to leave the community. 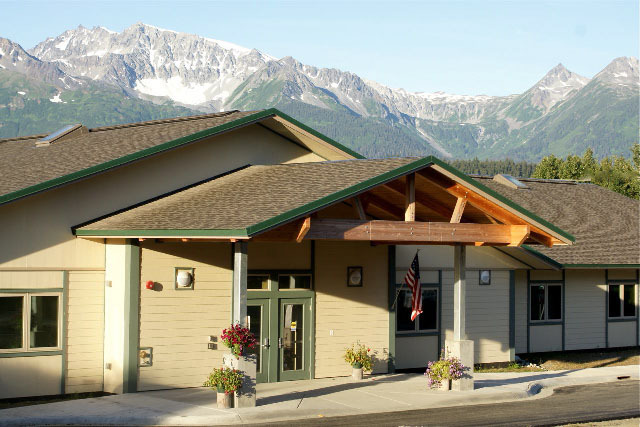 The Haines Borough Government recognizes the urgency to provide assisted living for seniors. An assisted living facility is a high priority in the Haines Comprehensive Plan and Community Economic Development Strategy. Demand for 12 assisted living units to house seniors was documented in the Haines Senior Housing Market Estimates Report (2000) by the Alaska Housing Finance Corporation. Haines Borough has Greatest Proportion of Elders in State. Haines Borough has Greatest Growth in Elder Population. Haines Ranks Seventh in State for Personal Per Capita Income. Demand exceeds Projected Capacity by 13% in Year One and by 100% in Year Three. Many Will Have Long-Term Care Insurance. 25% of Immediate Demand Meets Medicaid Waiver Eligibility. 87% of Near Future Demand Have Personal Finances or Adequate Insurance to Pay Projected Housing and Assistance Fees. Only 4.2% of Elder Population Needed to Sustain 100% of Capacity.